MLB's latest case of lost umpire luggage gave Carlos Torres an excuse to wear a most unique red-and-blue mask in Texas. It was actually the second day that Torres and crew had missing gear and uniforms in Texas, though Torres' preference for the hockey-style mask meant that a solid black replacement was not readily available. 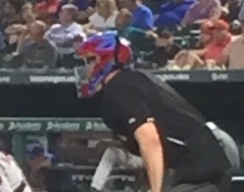 Plate umpire Torres wears a colorful mask. As we'll discuss momentarily, Major League umpires have a long and rich history of wearing makeshift uniforms when their luggage gets delayed or lost. Related Post: Train Delay: Umpires Stuck in Traffic, Game Stalled 16 Min (4/10/13). Instead, Torres borrowed a Texas Rangers themed bucket, complete with red and blue paint. Torres' shin guards were also provided by the Rangers, with blue highlights adorning a pair of New Balance plate shoes. As for the rest of Dana DeMuth's crew, their uniforms didn't timely arrive in Arlington, either. A healthy dose of oversized non-numbered umpire shirts with white piping circa-2016 and adjustable snapback caps first made an appearance during Monday's game. For what it's worth, DeMuth's crew was in Milwaukee over the weekend. Crew Chief DeMuth's generic shirt & hat. This isn't the first time in recent weeks and months that umpires have been separated from their luggage. The Tampa Bay Rays home series which was relocated to New York's Citi Field, for instance, also featured an umpiring uniform oddity as all four umpires on Ted Barrett's crew wore uniform shirts or jackets with John Tumpane's sleeve number 74 on them (including Tumpane, naturally). Due to a cataclysmic hurricane, the crew's gear was delayed. Understandable. 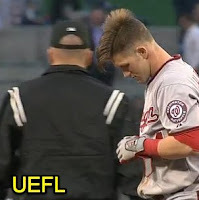 Logistical issues have long plagued umpires, from April 10, 2013's 16-minute delay because Tom Hallion's crew was stuck in traffic to Hunter Wendelstedt ejecting Jim Tracy in 2011 hours after the Layne crew had gotten stuck in traffic en route to Dodger Stadium. Gotta love LA. Jeff Nelson's makeshift umpire uni. 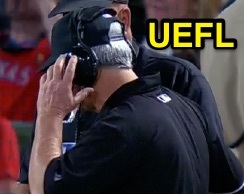 In 2013, Jeff Nelson wore a generic umpire jacket with white shoulder rings (and snapback cap) due to a luggage delay, likely prompted by Nelson's late flight from Detroit to San Diego for the series (he switched crews). 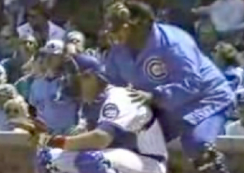 Fortunately, Nelson's gear arrived later on that night, and he changed into his familiar #45 jacket between innings. Related Post: Wardrobe Malfunction: Snapback Cap, Top Strike San Diego (5/16/13). Then there's the ballad of Angel Hernandez and the perpetually-worn snapback cap that Hernandez opted to wear in place of the standard custom-fitted model. Eric Gregg calls balls and strikes at Wrigley. As it were, the modern era's spare set of generic umpire uniforms, adjustable hats, and unique headwear is child's play compared to what yesteryear's umpires wore when their luggage failed to show up. Throughout the years, we've seen CB Bucknor in a generic rain slicker, Eric Gregg working the plate in a Cubs outfit, Larry Young's crew wearing Cleveland Indians hats and jackets, and Ed Montague wearing a full-on Philadelphia Phillies jersey as he officiated at home. MLB began using DHL as the official shipping company for umpire equipment shortly after the rather comical incidents of the 1970s, 80s, and so forth; is another change on the horizon?